After a somewhat bland 1-1 draw with Australia on Saturday, the Taeguk Warriors will play once again in Brisbane against Uzbekistan. Hopefully the performance and result will be better because Saturday against the Socceroos left a lot to be desired. If you haven’t already realized, I’m a bit of a football nerd. One of my favorite podcasts is the Men in Blazers podcast with Roger Bennett and Michael Davies. Roger Bennett, a lifelong Everton fan, has a funny little bit he likes to do when talking about Everton youth players getting first team minutes. He just exclaims, “Play the Babies!” I want to echo that to Bento. Just do it: play the babies. Show us the future. 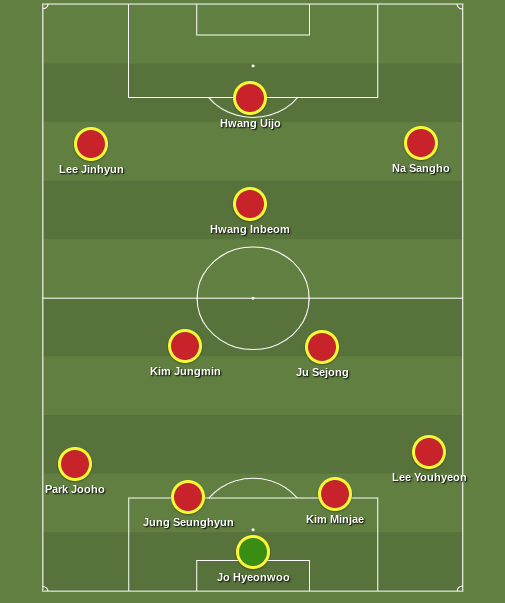 Give us a young lineup of players that will be tasked with leading the Taeguk Warriors forward for the next 4 years. At the back, surprise inclusion Lee Youhyeon should be given a look to see if he has more to offer than Lee Yong. Jung Seunghyun has just won his first ACL Champions League and he could form a great partnership with Kim Minjae if he were given the opportunity. The hype around Kim Jungmin of FC Liefering (Red Bull Salzburg’s feeder club) is that he could be a successor to Ki Sungyeung. It would be really cool to see what kind of midfield duo he could form with the very solid Ju Sejong, who was a bright spot against Australia on Saturday. When it comes to Hwang Inbeom, I just don’t think he was suited to the role he was asked to play on Saturday. He’s more of a creative/attacking midfielder than a straight central midfielder. I think he will create better opportunities if played as a CAM/No. 10. On Saturday, he just looked out of place trying to win the ball and make passes forward up to the attackers. Overall, the balance of the midfield was off and I think this might be a better midfield unit. In attack, Hwang Uijo is the man of the moment. If you really want to see more goals though, it is time to stop giving players like Moon Seonmin and Nam Taehee chances. Let’s see what the hottest young K League attackers can do. Both Na Sangho and Lee Jinhyun have been involved in a lot of scoring and assisting at the K League level so give them a shot to replicate that against Uzbekistan. Uzbekistan are one of the AFC nations always trying to break into the upper tier of the confederation. In the past two cycles of World Cup qualification Uzbekistan has narrowly missed out, losing the Asian playoff in 2013 and finishing 4th in final round in 2017. After a 0-0 draw with Lebanon last Thursday, I’m sure they’ll be looking to do better tomorrow morning. I’m not too sure about their current lineup so I won’t guess their lineup. Score Prediction: 2-0 Korea. I hope I’m right this time! Never knew Lee Jinhyun could play on the wing…didn’t he play central midfield for Korea during the Asian Games? What’s his best position/where do you see him fitting on the KNT for the future? Not really sure to be honest, but I think he plays more attacking midfield than central midfield for Pohang. He likes to get forward and shoot from distance so I put him at winger. He was left off the squad for these friendlies.